Among the actions that didn't make the transition from Workflow to the new Shortcuts app for iOS 12, built-in support for triggering IFTTT applets (formerly known as "recipes") is perhaps the most annoying one. With just a few taps, Workflow's old 'Trigger IFTTT Applet' action allowed you to assemble workflows that combined the power of iOS integrations with IFTTT's hundreds of supported services. The IFTTT action acted as a bridge between Workflow and services that didn't offer native support for the app, such as Google Sheets, Spotify, and several smart home devices. Fortunately, there's still a way to integrate the just-released Shortcuts app with IFTTT. The method I'm going to describe below involves a bit more manual setup because it's not as nicely integrated with Shortcuts as the old action might have been. In return however, you'll unlock the ability to enable IFTTT triggers using Siri on your iOS devices, Apple Watch, and HomePod – something that was never possible with Workflow's original IFTTT support. Let's take a look. 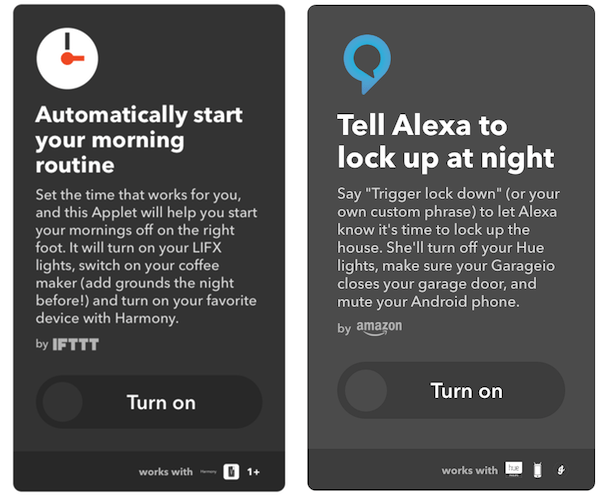 Last November IFTTT, the popular web automation platform, introduced powerful applet tools to its Partner tier of users. The Partner tier was not designed for the average user though, and was therefore cost prohibitive to most. But today, IFTTT announced that some Partner benefits are becoming accessible to a broader base of users with a new Maker tier. This tier is free, but it must be signed up for to gain the new applet tools. Another benefit of being a Maker is that you can build applets for any service on IFTTT, whether you have an account with that service or not. Previously, actions could only be used in an applet if you had a connected account tied to that service or device, but that's no longer the case. This ties in well with another Maker benefit: public profile pages. Each Maker will have a public profile for sharing all of their applet creations. 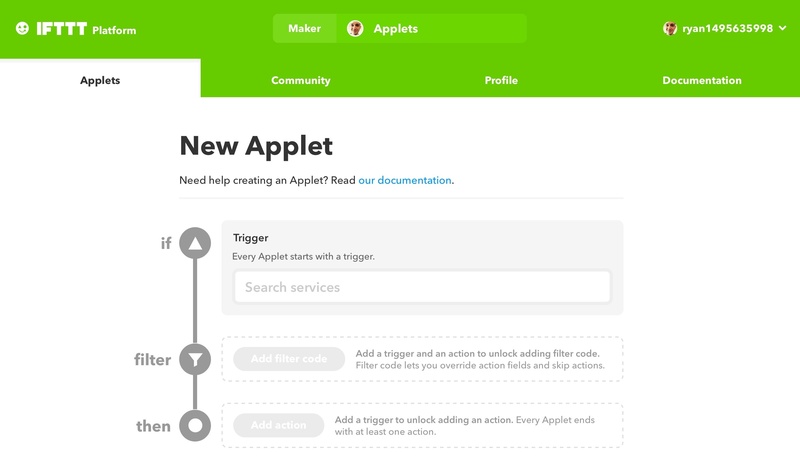 Creating applets using the Maker tools must be done on the web; the IFTTT iOS app does not currently provide access to any Maker tools, and it is unclear if that will change in the future. 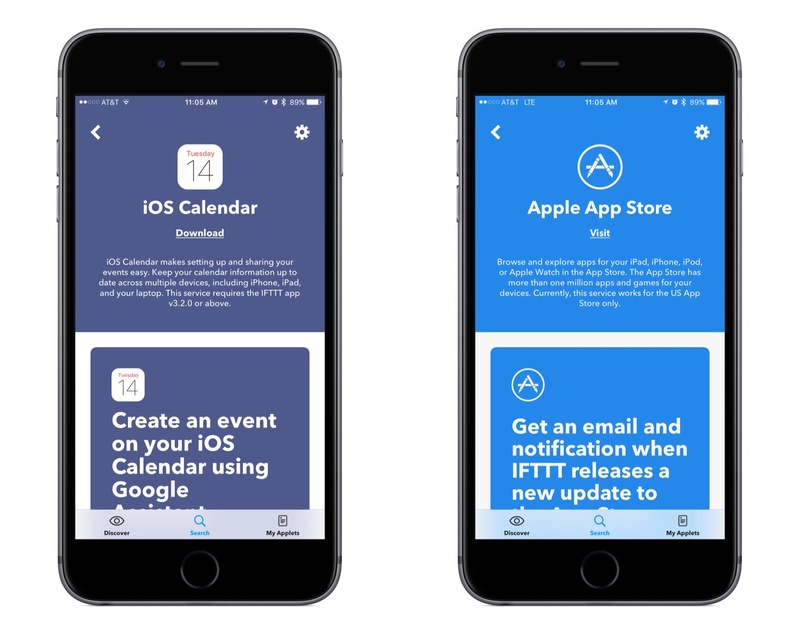 IFTTT, the popular web automation platform, has two new Apple-supported applets launching today: iOS Calendar and the App Store. Both of these new applets feature recipes created by IFTTT. 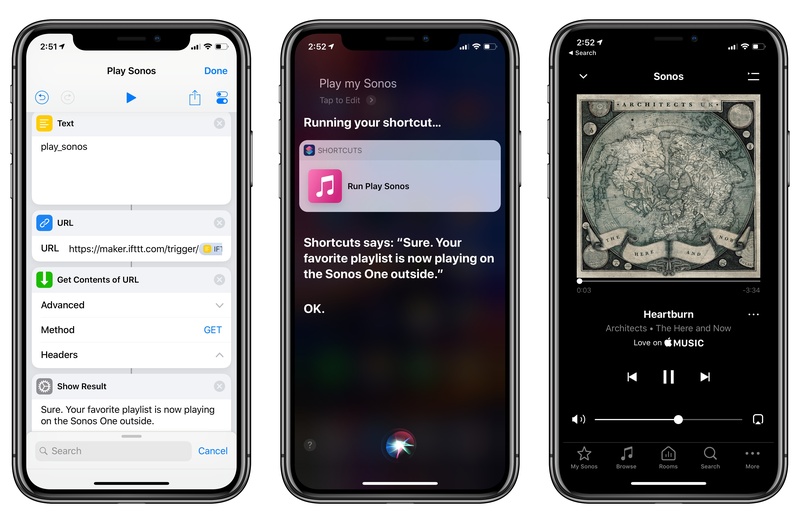 These include several recipes prominently featuring integrations with Apple's competitors, such as recipes that enable creating an iOS Calendar event using Google Assistant or Amazon Alexa. A sampling of IFTTT-created recipes. The latter of these is the most interesting. It allows your trigger to fire whenever a new event contains a specific keyword or phrase. Searches for keywords look into an event's title, location, notes, and invitees, making this a great option when crafting recipes with a deep level of specificity. IFTTT is available on the App Store. In the past, you used IFTTT by adding Recipes, which were “if this, then that” connections between two services. Today, Recipes have evolved into Applets. Applets can do everything that Recipes could — and much more. They bring your services together, creating new experiences that you can unlock with a single switch. 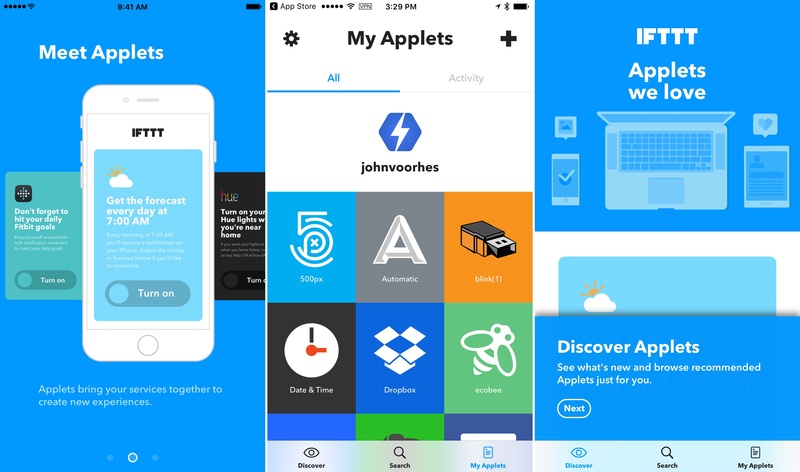 The introduction of Applets includes a redesign of IFTTT.com and the combination of IFTTT’s IF and DO apps into one app called IFTTT, which can be downloaded for free on the App Store. 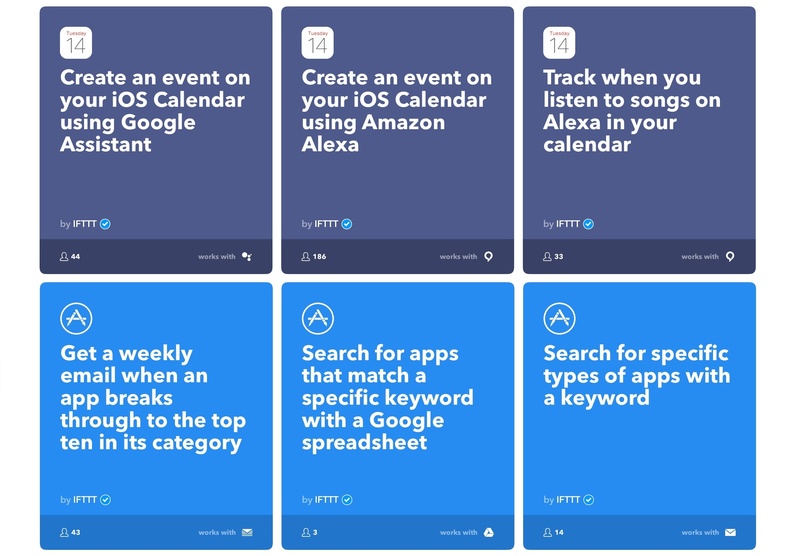 IFTTT is also adding tools for its partners to build services that take advantage of Applets’ multiple action and filtering capabilities and opening its partner platform to anyone with an API, which should help IFTTT add to its library of Applets quickly. Multiple action support is a big deal for IFTTT that opens up a wide array of possibilities. It will be interesting to see what integrations are built. Interesting move from IFTTT: the company has launched a developer platform to let third-parties enable recipe-building functionality into their apps. We’ve worked closely with a select group of partners to add IFTTT directly into their apps. Users will be able to discover and activate IFTTT Recipes without having to leave a partner’s app. These native experiences make IFTTT more accessible than ever. Our partners all have one thing in common: the desire to add value and enable a more seamless experience for their users. Explaining IFTTT's web automation is probably the biggest hurdle to get started with the service. Having a streamlined recipe interface inside multiple native apps could help. One of the unique traits of Workflow is its integration with native iPhone and iPad apps. By abstracting URL schemes from the process of building workflows that communicate with apps, the Workflow team has been able to offer actions to automate apps such as OmniFocus, Drafts, and Ulysses with support for text, images, and even documents. Increasingly, however, iOS users who rely on their devices as their primary computers are leveraging web services for their daily tasks. And in the past few years, a different kind of automation – web automation – has complemented (if not replaced altogether) native automation to save time on the iPhone and iPad through web APIs. The Workflow team knows this, and their latest integration is aimed at extending Workflow to any web service – even if it doesn't offer an iOS app or a native web action in Workflow. Today, Workflow is launching a new IFTTT integration to trigger web recipes. 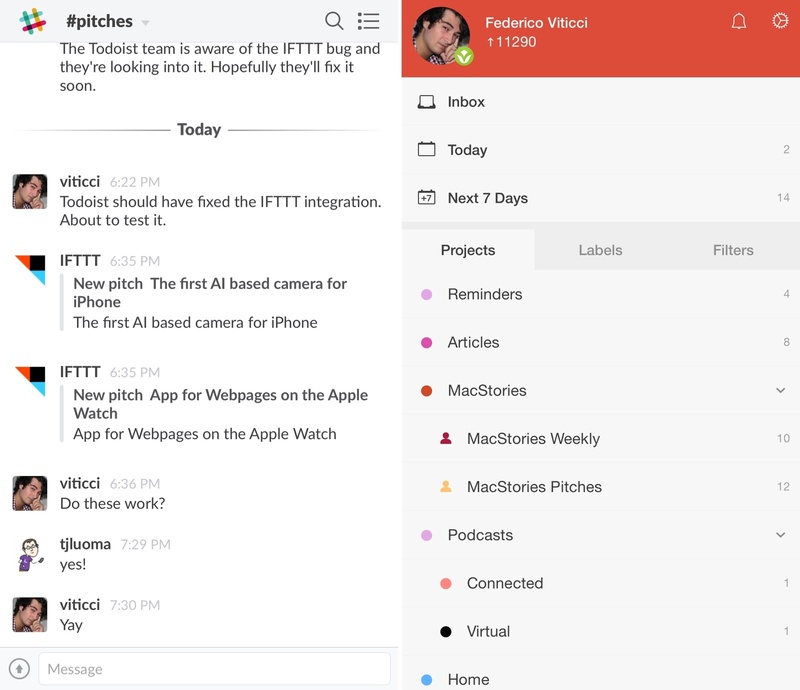 By fusing workflow actions with the power of IFTTT's web API glue, IFTTT support in Workflow promises to take iOS automation further than it's ever been, drastically altering the scope of Workflow's capabilities. Great change for those who want to populate their journal entries with content from the web: Day One has launched their IFTTT channel today, which will let you create all sorts of automated recipes such as saving Instagram pictures to a journal, emailing a new entry to yourself, or logging check-ins from a third-party service. Much as Day One 2 was criticized for ditching iCloud and Dropbox in lieu of its own sync, integrations like this are always better when the developers can fully control the sync platform they're using. Thanks to Day One Sync and support for multiple journals, you can connect to IFTTT and set your recipes to save data into a dedicated journal separate from your main thoughts (something that bugged me a few years ago with a similar solution). 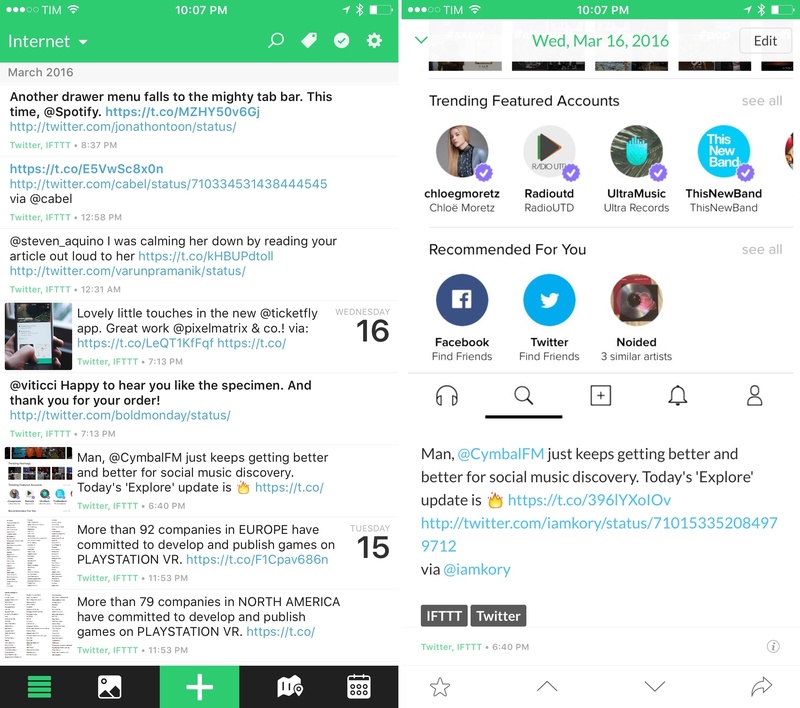 I've been playing around with the beta of Day One + IFTTT, and it works well. I have recipes to save liked tweets and YouTube videos to an 'Internet' journal, and I'm planning to build more soon. If you use Day One and IFTTT, this is a fantastic addition. 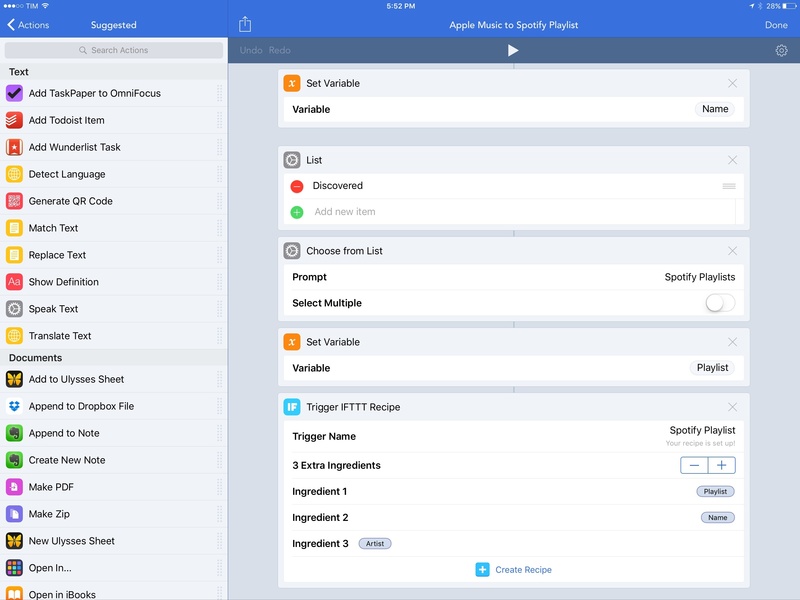 This is an interesting idea by IFTTT: a Spotify channel to create automated recipes for the music service so you can connect it to other apps. Triggers include new saved tracks and tracks added to a playlist (the same are available as actions). I haven't kept my Spotify account since switching to Apple Music, but this is the kind of integration that likely won't ever come to Apple's service, and it seems like you can create some pretty cool recipes with it. Worth checking out if you're a Spotify user and are into web automation. I recently decided that I wanted to overhaul the way I deal with email pitches (new apps, hardware accessories, web services, etc.) and I set out to find a solution that would allow me to broadcast an email to my team without having to forward more emails. Inboxes got overcrowded, I couldn’t easily keep track of pitches assigned to someone else, and everybody was unhappy. For years, I envisioned a system that, with one tap, would allow me to put an email message in a folder and forget about it, while it would still be broadcasted to my team so that others could take it into consideration. After weeks of experiments, I chose to leverage web automation and two tools I already use for todo management and team communication: Todoist and Slack. The solution I landed on is remarkably simple, but it took a while to get it just right and work around a few unexpected bugs.